Auto Ignition 6-in-1 Comprehensive Teaching. The training set uses an automotive ignition physical system in order to satisfy the requirements for teaching and training projects on the car traditional ignition system, Hall electronic ignition systems, magnetic induction ignition systems, photoelectric sensor electronic ignition systems, no distributor ignition systems and no grouping independent distributor ignition system structure, working principles, fault diagnosis and fault setting. 2. The teaching board can do comparisons with one or more ignition types. 3. It also has a professional fault setting area and exclusion area, so that it can set a variety of common and uncommon faults. 4. The teaching color is engraved with colorful ignition system schematics, and equipped with a detection terminal to detect the pin and various electrical component signals, such as electrical resistance, voltage, current, and frequency in order to strengthen the student’s hands-on ability. 5. 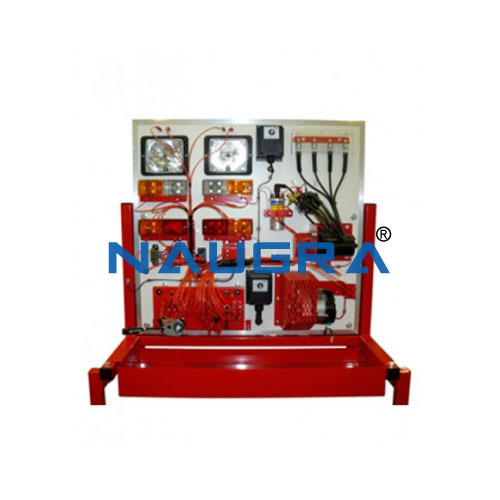 The teaching board is equipped with a diagnostic block, which can connect to dedicated or universal car decoders for effective self-diagnosis functions like reading fault codes, clear fault codes, and reading data streams of the electronical controlled system.